For over 20 years, we have manufactured gel strings that will fit any scroller, even if it is not a Wybron. We understand the importance of color to stage lighting, and bring Wybron’s exacting standards to our production of custom lighting gels. Take a look at our online gel swatch book to see the endless options available and use our project book for creating and building gel strings. When you are ready to order: log in here. 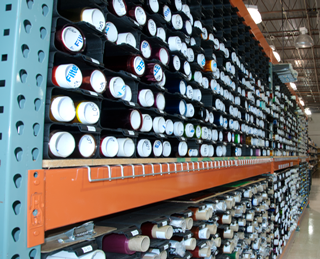 With over 600 colors to choose from, and placement in 16 different positions on over 85 different scrollers, Wybron’s custom gel strings can create any color under the sun. From your desktop, you can use our Color Express to research and order your custom gel strings in one step. Or, if you are on the go, try using our gel swatch library app to research the exact color that you want right from your iPad or iPhone. Then place your order online with Color Express. Either way, we make it easy to get exactly the color you want. We stock hundreds of the most popular color gels from all the top brands including Lee, Rosco, Apollo and Gam. We let you view all your past orders and place new orders online. Our custom gel strings are always precisely square, accurately cut, and perfectly assembled. We fill orders quickly and do our very best to ship an order within 24 hours after it was placed. You will find information about each lighting gel we carry from all of our manufacturers. 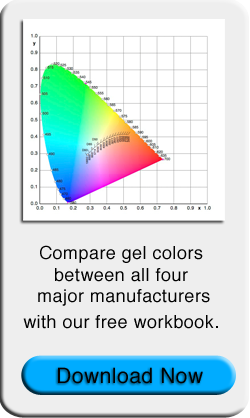 We provide chromaticity value, transmission graphs, and representative color display for each gel. Wybron Inc. has been a leader in lighting innovations for over 30 years and is committed to inventing, manufacturing, and marketing products that advance the art of lighting. Our commitment to quality and attention to detail is demonstrated by our always precise, accurately cut custom lighting gels.